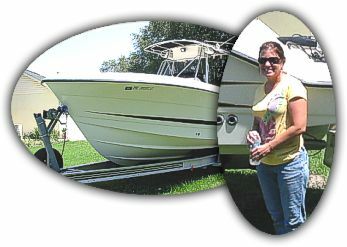 Catalina Custom received a request from James & Rhonda Fox of Dade City, Florida to redo the complete soft upholstery in this nice 28' Hydra Sport. 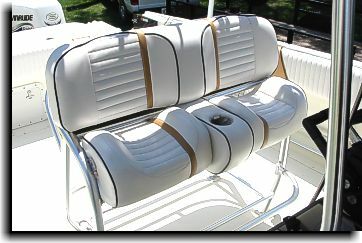 Catalina Custom was given the ok to redesign the upholstery with a more practical and enhanced design. Practical in the aspect of doing away with all the black vinyl on the facing of the seats and panels as was done originally. The only black put on the seats was a black welting for a design accent. 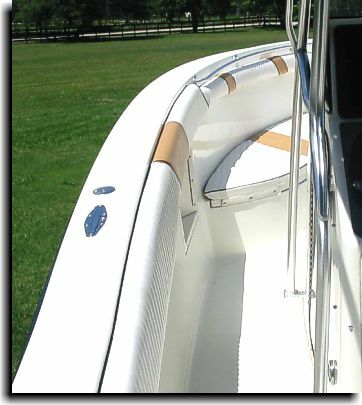 Catalina Custom also enhanced the design by using a combination of quilted white vinyl picking up on the original tan stripe with a tan colored Softside vinyl for accent stripes and also using a Softside white vinyl for the trim. 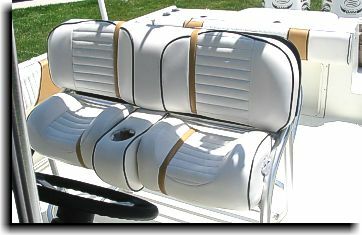 The bow cushions were originally plain white. 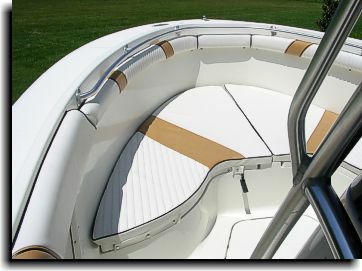 A combination of quilted white, tan and plain white with a black welt made the bow section. 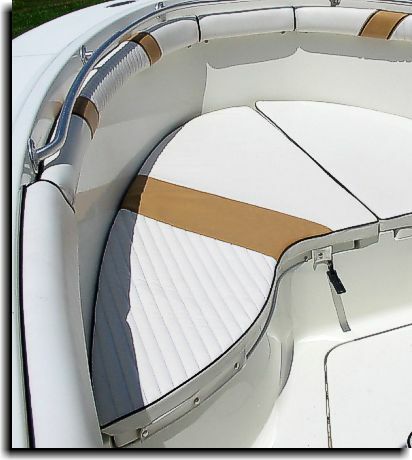 Also, new mildew resistant 2" foam was properly cut to shape (for the bow wall angle) and installed to make the cushions not only very appealing to look at but comfortable to sit on. The driver and passenger seats were redesigned with a more comfortable facing by making the original black middle white and enhancing the design with a quilted vinyl for the middle of the inserts and using a black welting for the outline design. 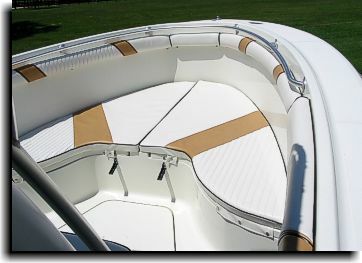 Aft wall panel with the enhanced design. Front of the console seating with the matching enhanced design. Below is the remainder of the side wall panels. The main panels were 15' long. The redesign for the panels again did away with large black panels on the facing. 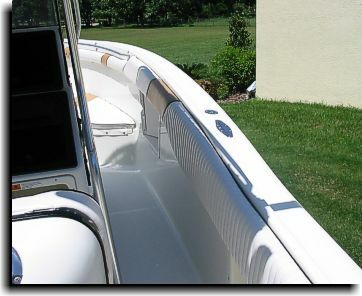 The customer actually complained how the original black panels would scald them when they would lean against them when boating. 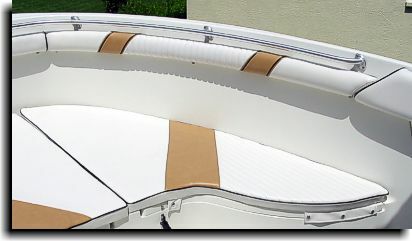 Also of note, the design for the panels consisted of alternating plain white, tan accent stripe, white quilted vinyl and then repeating this process all around the inside from one side to the next. 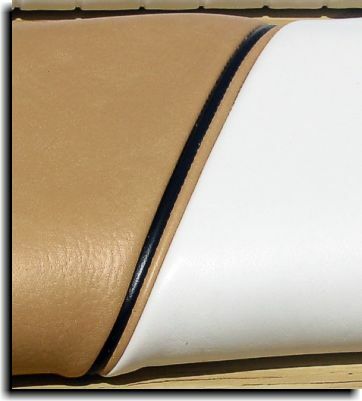 A unique tan/black welting was constructed and used to seperate all the sections of different vinyls (a close up of this welting can be viewed below). 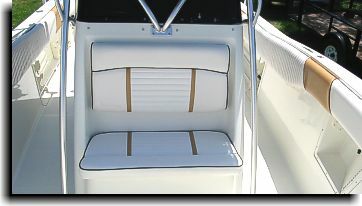 Front bow wall panels carried the alternating side wall panel design and nicely complimented the bow cushion pads. 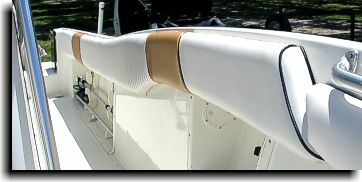 Closeup of the unique double black / tan welting to seperate the vinyl panels.